Snowmass Village's new mayor, Markey Butler, will be sworn in November 17. SNOWMASS VILLAGE – Markey Butler is the first woman to rule Snowmass Village in its 37-year history. Butler moves to the mayor’s chair beginning Nov. 17, where she and her colleagues, including newcomers Bill Madsen and Bob Sirkus, will discuss the appointment process for her open seat. The winner on Nov. 4 with 538 votes or 51.5 percent of the electorate, Butler beat a surging Jason Haber, who had 381 votes or 36.4 percent. Arnie Mordkin was third with 125 votes, 11.9 percent. A total of 1,044 local voters participated in the mayoral election and in the council race, where voters could select two candidates, 1,829 were tallied. Thrilled to be done with the bruising, often ugly, campaign, Butler wants to dispense with the drama and dig into the big issues facing Snowmass Village, of which there are many. Butler’s Teflon-tough determination in the political arena may owe to her “real” job as the executive director of Hospice of the Valley. It’s also not surprising that Butler is the mother of two strong women: Deanna, a dot.com lawyer, and Amy, a critical care veterinarian. After a long day of discussing late-life care options with regional hospice directors, Butler let down her hair over drinks at the Glenwood Brew Pub. 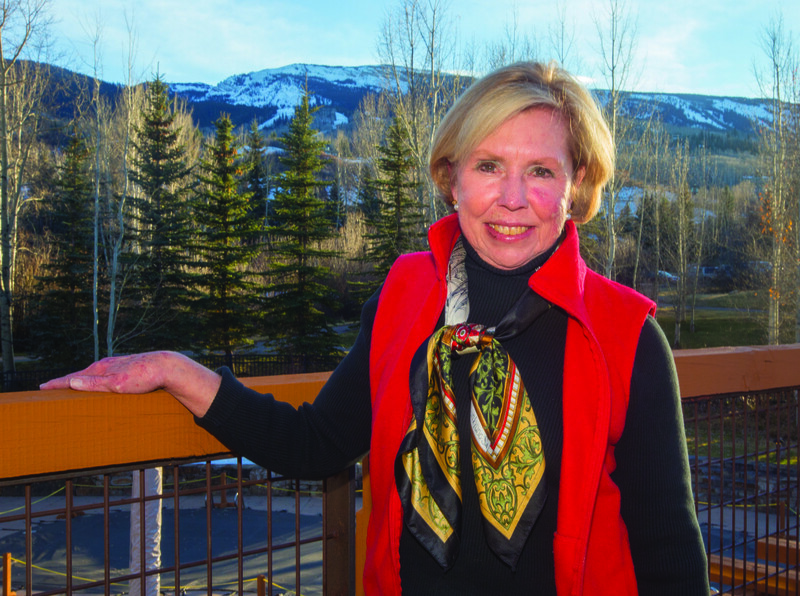 Aspen Journalism: You are the first woman mayor in the history of Snowmass Village. Why is that a big deal? Markey Butler: It is an honor to be the first. There have been only six women ever in public office in Snowmass. I think we need to celebrate it. I would love to see more women in office and on boards. AJ: It’s been a rough year for the Snowmass Village Town Council. How are you planning on turning around the council mood? MB: It’s all about healing. You invite people into the council chambers. I’ve already talked to Clint (Kinney, town manager) about it. We’re going to bring in a CML (Colorado Municipal League) speaker who will speak about best practices. If you are an elected official, you have a duty to perform ethics and best practices. AJ: Has your opinion about ex-parte communications — and the appearance of ex-parte communications — changed given the events of the past month? MB: No. In terms of what I did [it] wasn’t ex-parte. [Butler then referenced an upcoming “Trees of Hospice” ceremony where] there will be SkiCo people who show up at a public event. It’s kind of sad to the extent that you can’t even say hello to someone. I waved to Dwayne (Romero, Related Colorado president) at my election party but I couldn’t say hi. AJ: Related to the previous question, Richard Goodwin’s suit against the town will be addressed by a judge in the coming months. Will the specter of that suit make you more cautious, or change the way you govern? MB: That goes without saying. It’s a very sad comment about our small community. AJ: Was the election its own referendum on Base Village? MB: People really did want Base Village. I’ve been talking at the various parties; going to Mountain View employee housing and less than 10 percent didn’t want Base Village. One night this fall we were in Beaver Creek where there was 88 percent occupancy at the Westin. In October! That spoke volumes. AJ: Should the developer be allowed to skip the sketch plan step for its major PUD amendment, given there are significant changes when compared to the original 2004 agreement? MB: I haven’t seen any part of the application. You’ve already seen the Limelight. It’s ready to go. Why would you want to send it back to sketch plan? With Oaktree (Oaktree Capital Management signed a letter of agreement to develop up to 44 wholly owned and fractional residences in Base Village), I don’t know if we can break apart the application. Can you let one accelerate while you do more detail in sketch plan on the other part? AJ: What is your vision for the Entryway? MB: In the town survey and on the campaign trail the rodeo was considered very important, but you need to have more vibrancy than eight to 10 rodeos a year. A multi-purpose facility makes sense. You could have concerts there; think about Willy Nelson and Carrie Underwood coming into Snowmass. But it’s up to the community to make the decision. AJ: After Base Village and the Entryway, what do you believe is the number one issue facing Snowmass Village in 2015? MB: Housing is extremely important. If you look at the comp plan, there’s nothing in there about aging well and aging in place. We haven’t planned housing for people who are aging. Health care is a big issue, not just physical care but mental health. AJ: Chris Jacobson is the only carryover from the past council. Are you going to be extending an olive branch to him? MB: I think he needs to extend it to all of our council members. This election focused on that individual. Why is it that one person can destroy this town? With the three (new) council people, I think I can bring him into the fold. I think we can bring Chris in to (understand) best governance practices. Yes, I’ll sit down with everybody on the new council. That’s not an olive branch. That’s a conversation.